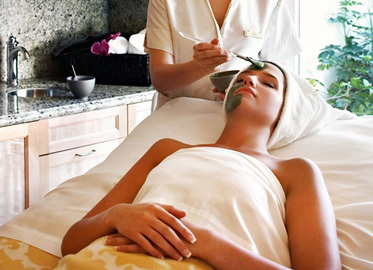 The Spa at Four Seasons Hotel Westlake Village! Tranquility Massage or Custom Organic Facial PLUS Shampoo and Blow Dry or Men's Cut at New Four Seasons Salon! (Value $245.) Includes Sparkling Wine or Smoothie! Appointments required. (Do not wait until the last minute to book your appointment as appointments are subject to availability.) Spa appointment and hair appointment must be made for the same day. Day at The Spa includes choice of 50-minute Tranquility Massage or 50-minute Custom Organic Facial AND shampoo and blowout or shampoo and men's haircut in new "Rhythm and Hair" Salon. Treat yourself! Treat a friend or spouse! Plan a Girls' Day! Most of you are already aware that we have one of Southern California’s top spas right in our own backyard. But did you know that we have a beautiful, state-of-the-art hair salon here too? Recently, I was fortunate to have a blow out at the beautiful new Rhythm and Hair salon located adjacent to The Spa check-in desk. Rhythm and Hair chairs are like none other, and my stylist used top of the line Oribe shampoo, conditioner, and hair products. The result? An absolutely gorgeous post facial blow dry! Wondering if can you purchase a facial or massage and hair certificate for yourself and additional certificates for your stressed out friends? Sure! How about one for mom for Mother’s day! Yes! 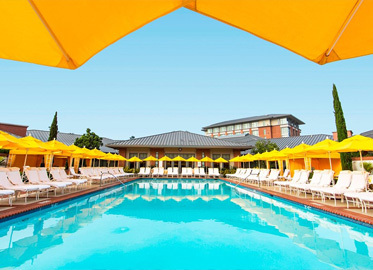 See you at The Spa at Four Seasons Hotel Westlake Village!